Q. Do you have my car? A. If you parked your car and it is not there when you get back the first thing you should do is determine whether the car was parked on private property or on a public roadway. If it was parked on private property, then you should look for Impound signs to see which company impounds from the property. If it was on a public street you need to call the local law enforcement agency for the city in which you were impounded. Give them the Make, Model and License number of the car and they can tell you who impounded the vehicle. Q. What do I need to provide after my car has been impounded? A. The registered owner of record is required to pick up a vehicle from impound. You will need to provide a valid Driver’s License and pay for the charges. A valid picture ID will work if you have someone with a valid driver license with you. 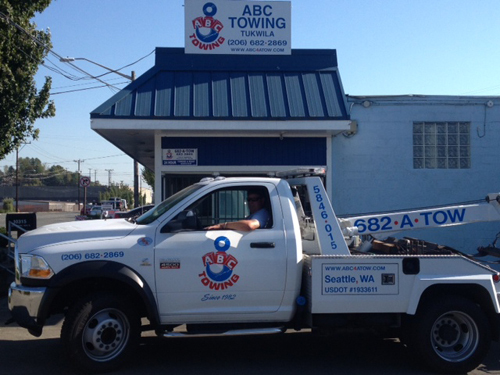 We can also tow the vehicle from our yard to most auto repair facilities and bill them directly. We accept M/C, Visa, Debit Cards and Cash. Q. You are open 24 hours a day why do you charge an afterhours fee? A. Our office hours are 8:00 to 5:00 Monday through Friday. Our office is closed on Holidays. We do have drivers available 24 hours a day 7 days a week 365 days a year. 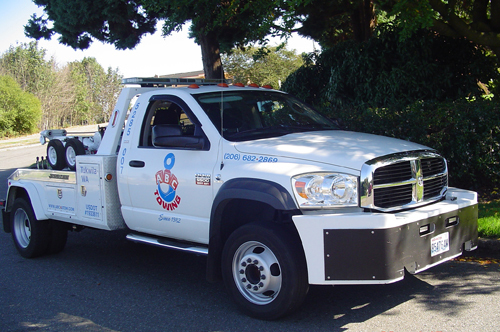 If you wish to pick up your vehicle after hours you need to call 206-457-2530 and set up an appointment and we will have someone meet you to release the car. Q. If the vehicle is not registered to me but I have a bill of sale, can I redeem the vehicle? A. A bill of sale does not constitute ownership of a vehicle in Washington State unless the impound occurred within the first 15 days of possession. Otherwise you must go to a licensing agent and transfer the registration into your name before attempting to redeem the vehicle. Q. What are the rules regarding claiming personal property from an impounded vehicle? A. . Personal property such as clothing, paperwork, CDs, tools, and infant & child seats are items that can be removed from a vehicle. Item that are attached to the vehicle are not removable. Only the Registered or Legal Owner can redeem personal belongings form a vehicle that has been impounded. Q. Can the Registered owner give me permission to pick up the vehicle? Q. Does your company charge to have “junk or hulk” vehicles removed and impounded from private property? A. In most cases there is no charge. Vehicles requiring special handling or filled with garbage and debris would have a fee assessed to cover the cost of disposal. If there is a charge you would be told what the charge is before we towed the vehicle. Q. 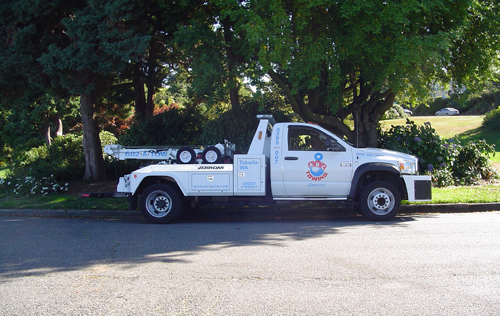 What are the laws regarding the impounding of a vehicle in Washington State? A. Any property owner or person authorized by the property owner may impound an unauthorized vehicle. 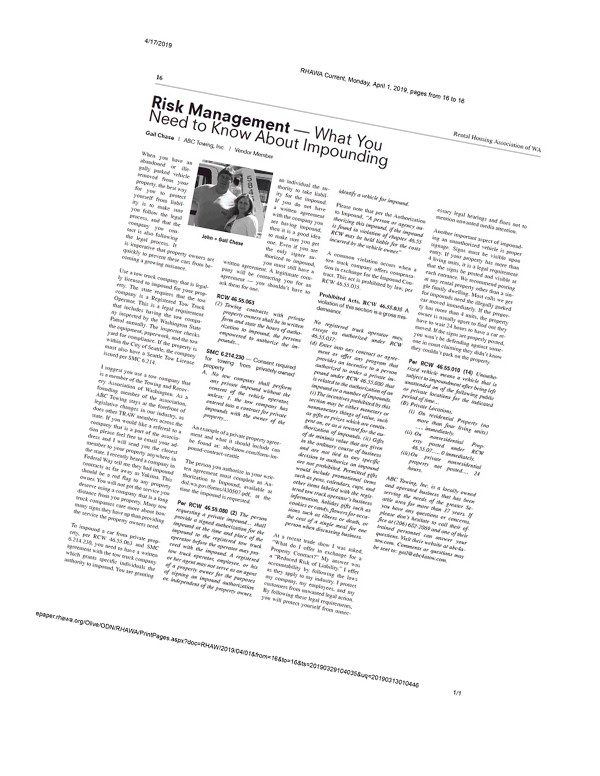 A written contract between the towing company and the property owner/manager is required by law. At the time of the impound the property owner or manager will need to complete a written Authorization to Impound that shows the identification of the car and signed by any person authorized by the contract. Both the Impound Contract and the Authorization to Impound can be downloaded from the forms tab on this website. Q. Is the property owner/manager charged for this service? A. No it is the responsibility of the registered owner to pay for the charges when the car is redeemed. Q. If someone has parked on the sidewalk and it is partially blocking my driveway, am I able to impound the car? A. Only if the vehicle is completely on the private property and not touching the City street or sidewalk and only if you are the Property owner or an authorized signer. In the case of the vehicle on a public street or sidewalk please call the local police non-emergency number. Q. Can you tow motorcycles? A. Yes, we can tow most motorcycles by using our standard tow truck that has special equipment. In some cases, with heavier or custom built motorcycles, we use a flatbed tow truck. Be sure to request the flatbed if you want or need one.